Gossip Stone: Are Certain Aesthetic Changes in Majora’s Mask 3D Necessary? It is not uncommon to hear people say that Ocarina of Time, when remade for 3DS, was changed in a few unfortunate ways. While still keeping the same plot, Nintendo still managed to change the overall feeling players got when journeying through certain places through changes in certain visuals. This is likely to happen in Majora’s Mask 3D, what with certain quotes from developers discussing the changes being made, but is it for the best? Join the discussion after the jump! It is no great mystery that Nintendo is often quite opposed to being too violent or obscene, but there are small things that should not be changed for the sake of keeping the player feeling the way the original development team intended. Again, going back to Ocarina of Time 3D, the Bottom of the Well was the best example of how Nintendo made the game brighter and, overall, more kid-friendly than before. There were other small examples, but this is the biggest. When I look at the removal of the obscene abundance of skulls in certain rooms, the blood on the Dead Hands, and certain chains and torture instruments in various rooms, it actually takes me out of the game’s immersion. I don’t see the new environment. I see the room full of developers discussing the removal of things that actually scared me – scared me in a fun way. No one was offended by it, and in the future, when people likely play the 3D version instead of the original simply for ease of access, they will think it was always like that, permanently lessening the experience. 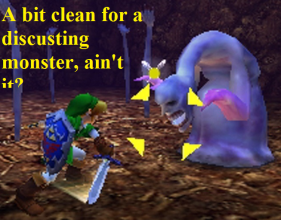 Majora’s Mask has plenty of instances where this could occur. I worry for the visual and even the audible impact of things like the Skulltula Houses, “Them” in Romani Ranch, Gomess, Ikana, and even Majora itself. I still think that the simple enlarging of Majora’s Mask’s eyes looks silly. The themes present in the N64 classic are often heavily based on visuals, and that was the whole point. Things were strange and unsettling, and you were meant to feel scared and put-off most of the time, for the sake of immersion and atmosphere. Now, who knows what Nintendo might feel is too unsafe to put in their new version. What are your thoughts? Do you think Nintendo will change a lot of Majora’s Mask’s creepy aesthetics, and if so, is that ok? Leave a comment below!